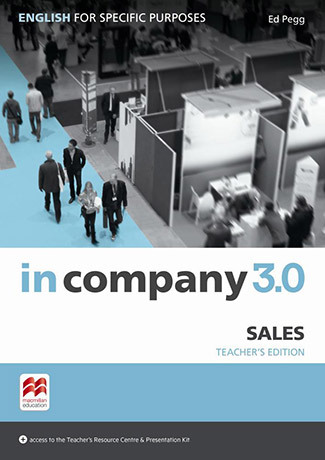 In Company 3.0 ESP Sales can be used by business professionals working in sales-related roles at different levels of seniority. The course uses the same communicative and people-skills focus as In Company 3.0, and can be used flexibly. It comes with a print Student's Book and access to an online Student's Resource Centre. The Teacher's Pack comes with a Teacher's edition of the print Student's Book and a webcode providing access to the Teacher's Resource Centre and Teacher's Presentation Kit. The Resource Centre contains teacher's notes, downloadable audio and video, downloadable tests and additional worksheets. Easy access to online and downloadable class audio and video content via the webcode for the Teacher's Resource Centre. Additional teaching materials, including comprehensive online teaching notes, a glossary and worksheets. Access to the Teacher’s Presentation Kit, a digital version of the Student’s Book with embedded audio, video and answer keys, for easy presentation of the material in class or remotely.